I’m so excited to finally share some news with you!! 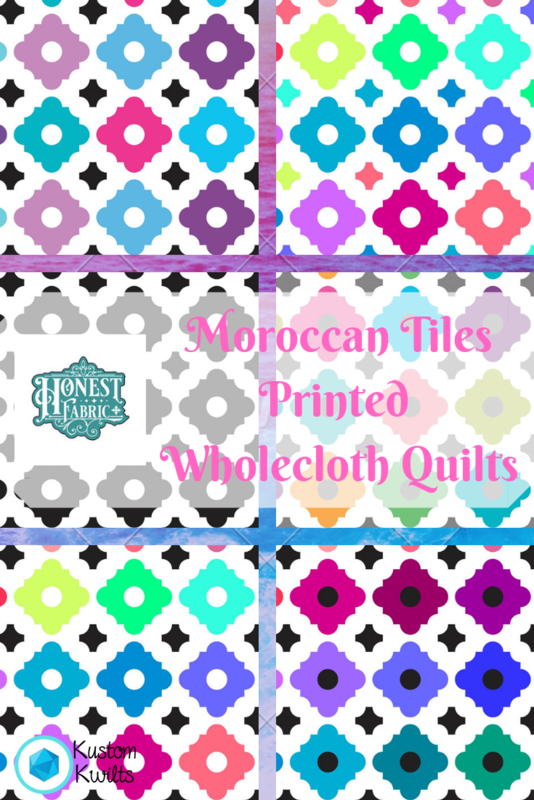 I’ve joined the fabulous designers at Honest Fabric to bring you some vibrant custom printed whole cloth quilt tops!! I know some people think piecing curves is a real bummer (it’s really SO much fun!!). So if that’s you–and you’ve been dying to get your hands on a Moroccan Tiles Quilt, you’re in luck. You can head over to Honest Fabric and choose from 6 different color ways, in three different sizes. I;m so exited to finally share these Honest Fabric Designs with you! There are 6 unique colorways for this design and I just LOVE how they turned out. Honest Fabric is having a sale through May 31 so you can pick up any of these awesome designs for 25% off with code 25off. A few months ago, I ordered some before I was a contributor from my friend Nelson Salsa. I picked up his “Tilt” design so I could try out some new quilting designs. I also bought Kwik Color Washed Diamonds by Karie Jewell, Fox Dreams and River Walk by Anne Sullivan. These designs are going to be so much fun to quilt up, and it takes the stress off and just lets me quilt without worrying about spending so much time piecing. All the designs I purchased from other Honest designers don’t currently have patterns out to piece them, so I would otherwise miss out on having a piece of the great artwork from these designers. I’m really happy with the quality of the printed fabric that Honest Fabric delivers. The fabric is soft and supple and colorfast. I’ve quilted up one of Karlee Porter’s designs that I purchased called Explosion. I did some graffiti style quilting on Karlee’s whole cloth design and used Quilter’s Dream Wool batting to really make the quilting POP. It was SO much fun to quilt, and I didn’t have to worry about bulky seams or any of the piecing! It was heaven. Anyhow, I hope you’ll check out some of the creative designs over at Honest Fabric. Take a break from piecing to quilt up some of these amazing printed quilt tops. Have fun, and happy sewing! Do you follow me on instagram? If you do, you might have seen I’ve been having a LOT of fun with videos lately. 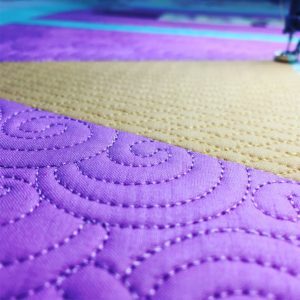 I’ve been doing some time lapse videos of some basic straight line quilting AAAAAND decided I’d do a real time video of how I bind mini quilts on my longarm. It’s seriously so easy that if you haven’t tried this yet, you’ll really kick yourself! When I bind my quilting samples on the longarm, I usually stick to pretty small sizes. You could definitely do this with a large quilt, just keep in mind that you’ll be doing some scrolling and advancing of the quilt to finish the job. It’s also a good idea to mark the large quilt so you have a good idea of where the squared portion of the quilt will be so you attach the binding straight. 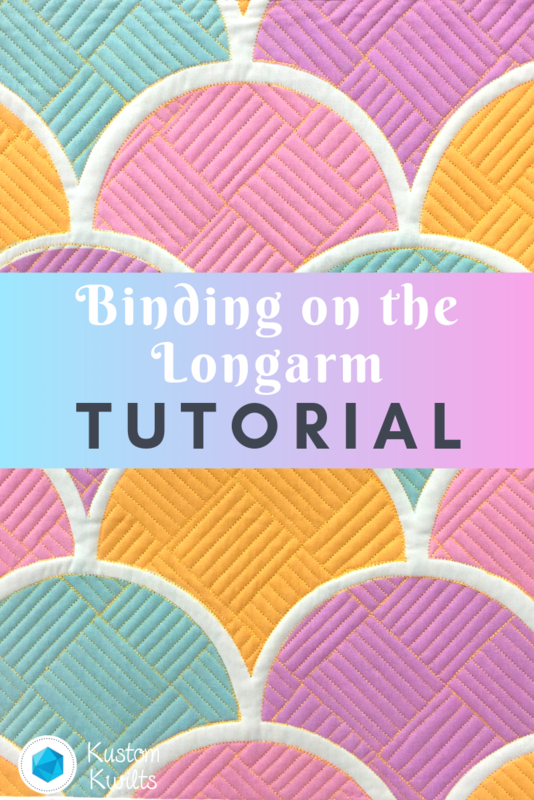 I only do this for quilts that are for myself–because for me this is something to do quickly as a shortcut and not great for accuracy, as I don’t spend a lot of time making sure I’m putting the binding on squarely. To make the binding, I cut strips 2.5″ wide x the width of the fabric and then sew them together, end to end to create the length I need (I usually do the perimeter of the quilt + 12″ to make sure I have enough). The tutorial shows how to attach the binding to the front of the quilt. After quilting, you’ll need to trim away and square up, then flip the folded edge of the binding to the back and finish. I finish all mine by hand because I’m a weirdo and love hand binding! I’m using an Innova 22″ longarm (hand guided) with a lightning stitch stitch regulator. 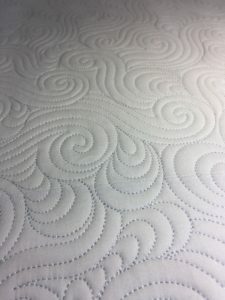 The fabric panel I quilted was a custom panel I ordered from My Fabric Design, and the thread I used for the quilting was Glide by Hab+Dash (previously Fil-Tec). If you’d like to see a time lapse video of the quilting of this panel, you can check it out on instagram HERE. This has been such a busy and exciting week for me! I had a little time away from sewing celebrating the Christmas season with our family (and our daycare was closed for almost two weeks–insert the screaming face emoji here ;). All joking aside, it was wonderful to get to spend so much time with the family and remember what’s important in life! I hope you were able to rest, recharge, and be around the people you love. 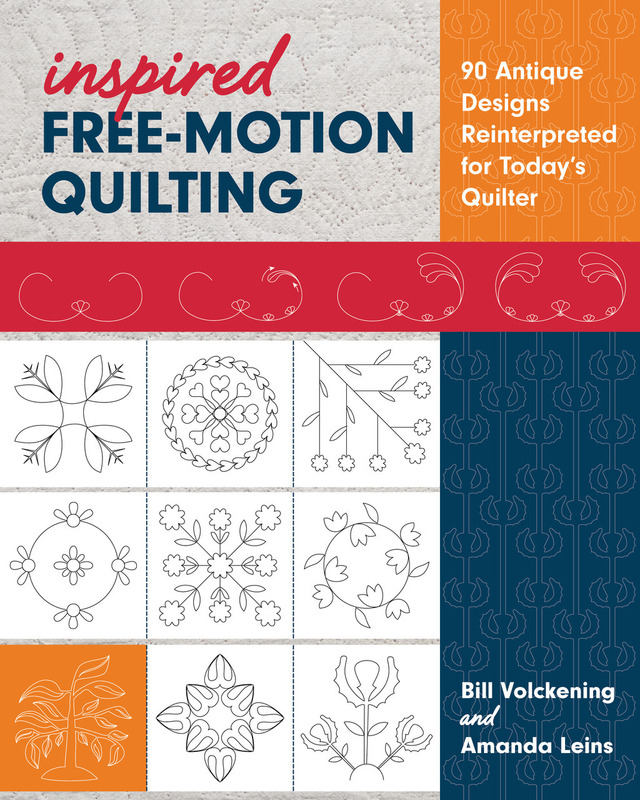 One thing I’m super pumped about is Amanda Leins and Bill Volckening’s new book Inspired Free-Motion Quilting. The book is described as “90 Antique designs reinterpreted for today’s quilter”. 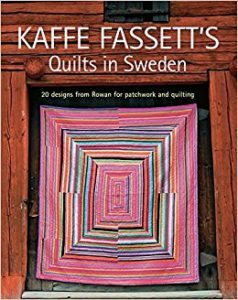 I do a lot of custom quilting, and this book is really inspirational, as far as brainstorming designs goes. There are pages of antique quilts with really amazing quilting designs, along with step-by-step instructions on how to execute and master each design. It’s a great reference for seasoned quilters and beginners alike. 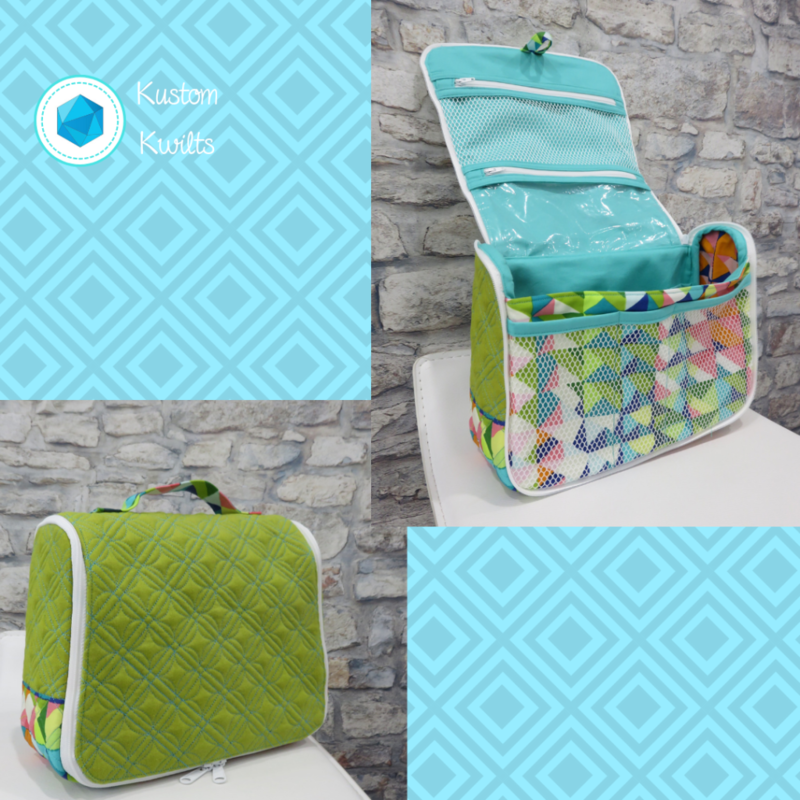 I’m so excited to be a part of the Inspired Free-Motion Quilting blog hop and team up with Mandy Leins and C&T Publishing to give away one free PDF copy (that means the giveaway is open internationally!!!) of this awesome book! Read to the end for details on how to enter. As soon as I was able to flip through Inspired Free-Motion Quilting, two designs immediately caught my eye that I knew exactly what I wanted to use them for. My two favorite motifs from the book are “Double lines and orange peel” and “Echoed Crosshatch”. I really enjoy making bags (in addition to the quilting I do), and I like to add a bit of decorative quilting to the exterior of the bag, if I’m able to. I had a new pattern I was really excited to try–The Gloss Cosmetic Bag by Sew Sweetness (Sara Lawson). The pattern is available with purchase of the Minikins Season 2 pattern bundle on Sara’s site. 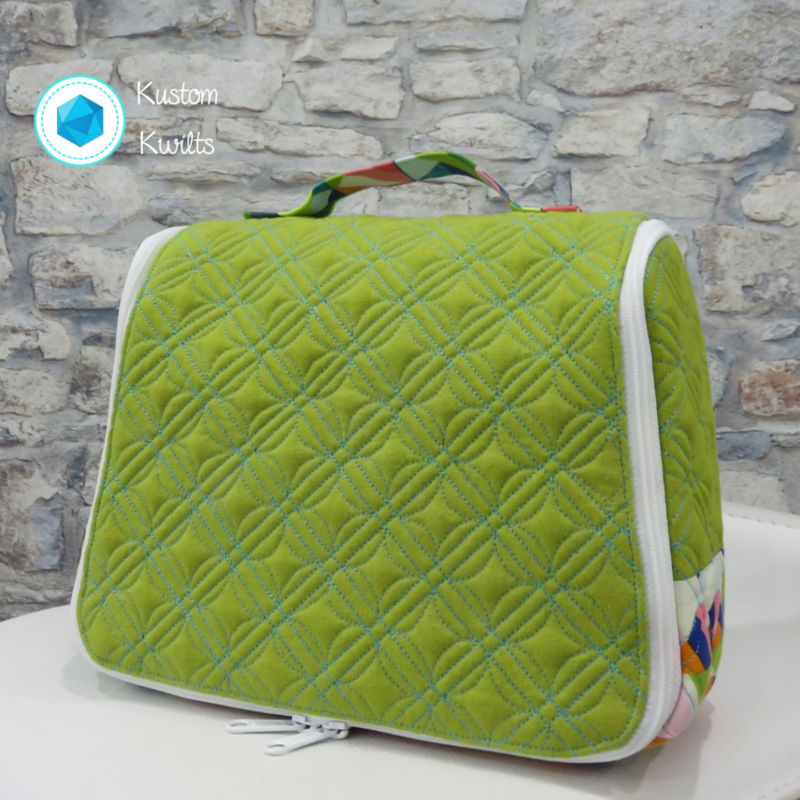 This is a really great way to spice up some solid fabric–and solid colors show off the quilting with less distractions than prints. I cut the green linen-canvas fabric I had slightly larger than the pattern called for and quilted it prior to assembling the pattern. I loved the instructions and diagrams that are included with the book–they really leave no room for error, even if you’re just starting out. I’m really thrilled with how impactful the design is that I selected from the book. I chose “Double Lines and Orange Peel” for a classic motif that would really look great on a cosmetic bag. I love the definition and texture it gives the solid–in what would otherwise be a really boring cosmetic bag. It’s not as easy to see in the picture, but I opted to skip the orange peels on the patterned fabric on the bottom of the case, and only quilted the echoed crosshatch. I quilted the bag components on my longarm, but it would be easy to do this sort of quilting on a domestic. 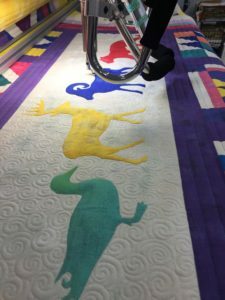 Just pop on a walking foot and measure out your straight lines, and follow the simple instructions for free-motion quilting the orange peels between the lines to finish up. I used a slightly contrasting thread color for a little pop, but I’m dying to make another in black canvas with black thread for subtle texture and style. 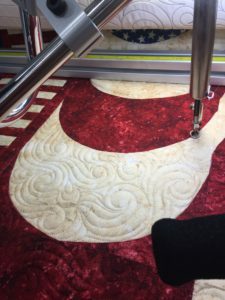 Amanda and Bill do a fantastic job of sharing some amazing antique quilts and their in depth knowledge of how to reproduce the motifs, and I highly recommend Inspired Free-Motion Quilting as a must have reference for quilters! Make sure you read below to enter the giveaway, and check out the other blog hop participants’ posts for more chances to win! Here’s what you came for!! C&T Publishing has so generously allowed me to give away one PDF copy of Inspired Free-Motion Quilting. All you need to do to enter is like my Instagram post and tag a friend in the comments OR leave a comment on THIS blog post telling me why you’re excited to get a copy of this book! The giveaway is open internationally and will close Sunday, January 13, 2019 at 6:00 PM, CST. The winner will be notified by me soon thereafter. Good luck!!! Happy 4th of July! I hope you’re getting to enjoy family and friends and all the great festivities that the 4th brings! In my neck of the woods, it’s hotter than Hades and we haven’t had a decent rain shower since March, so we may not be enjoying tons of fireworks this evening…we’re definitely praying for the little rain shower than is a minor possibility tonight. 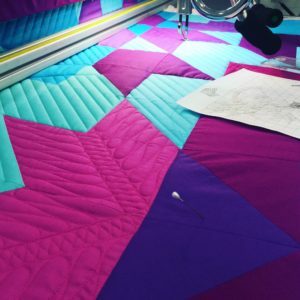 Now lets talk quilting tips and how to tackle planning your quilting design! 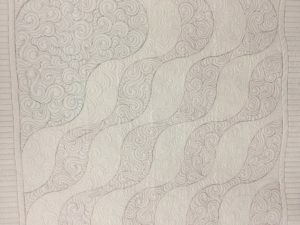 I recently got to quilt an American Wave Quilt (pattern by Lisa Moore of Quilts with a Twist) for my mother-in-law and thought it would be a good opportunity to share some of my quilting tips for adding texture and movement to your quilt tops and planning your overall quilting design. 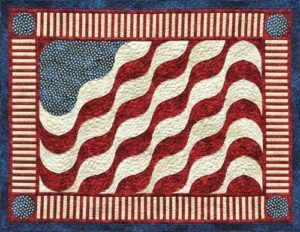 Even though I love bright colors and modern-traditional quilt designs, I have a great appreciation for traditional colors and patriotic quilts. Some of the first quilts I made when I was learning to sew were with traditional, warm colors and American designs. I’m using this quilt to talk about the 8 things I usually think about before I start quilting, but these tips can be applied to any quilt top. My MIL didn’t follow the pattern exactly as shown below, but this is the original pattern, by Lisa Moore, pictured below. 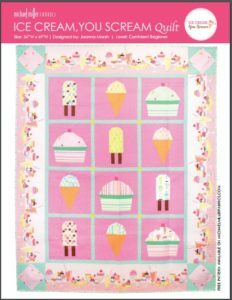 If you’re interested in purchasing the pattern, you can grab a PDF copy at Quilts with a Twist (this is not an affiliate link, I’m just crediting the original designer in case you want to purchase the pattern). 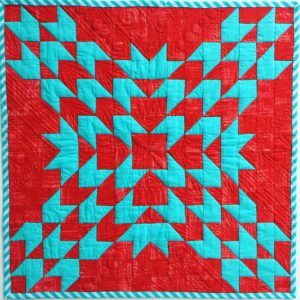 Consider the quilting as a design element of your quilt. When you get a quilt top completed that has so much work put into it–much as this one does–it’s important to consider the quilting as another design element and not an afterthought. In my opinion, a basic meander or other edge to edge can take away from the overall impact of the quilt.Since our goal was to enhance the movement already present in the piecing, we decided to stitch in the ditch, quilt swirly waves, add some stars to go with the theme, and quilt piano keys on the striped fabric border. Examine the layout of the quilt and follow the lines in the quilt to enhance the design.This quilt design already shows lots of movement in the piecing. 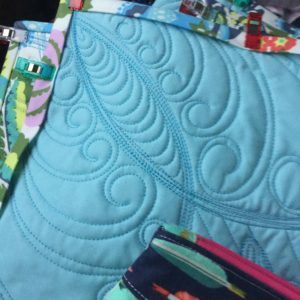 I opted to stitch in the ditch on the waves and within the different fabric colors, I quilted swirly waves. Another great quilting motif would have been to echo the wavy lines within the quilt to complement the already wavy lines.The red and white striped fabric wasn’t exactly stitched in the ditch (SID), since it was one piece of fabric and not pieced stripes, but I followed the lines of the colors and did a faux SID to make it appear that it was pieced. 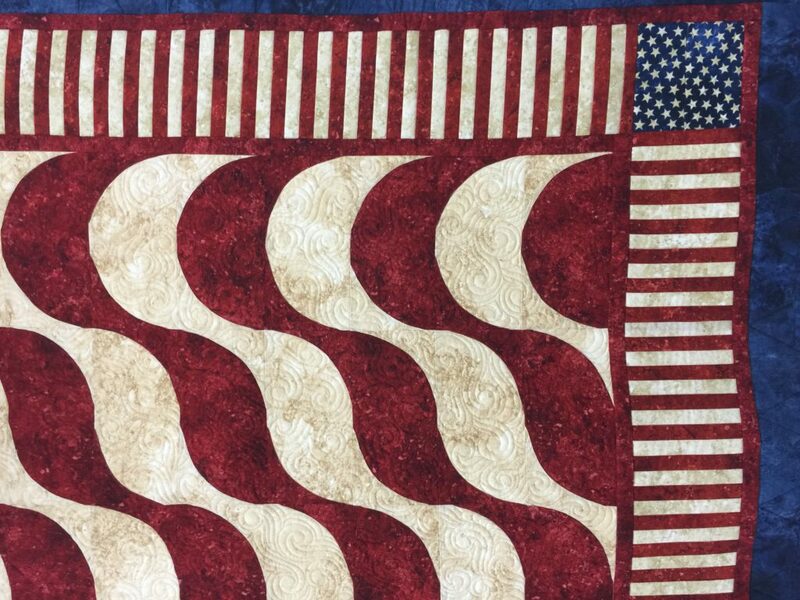 I used three different thread colors on this quilt–red, cream, and blue. I matched the thread colors to the fabrics I was quilting and changed them often. This isn’t always necessary, but it’s important to consider before you stick with just one thread color for the entirety of the quilt. 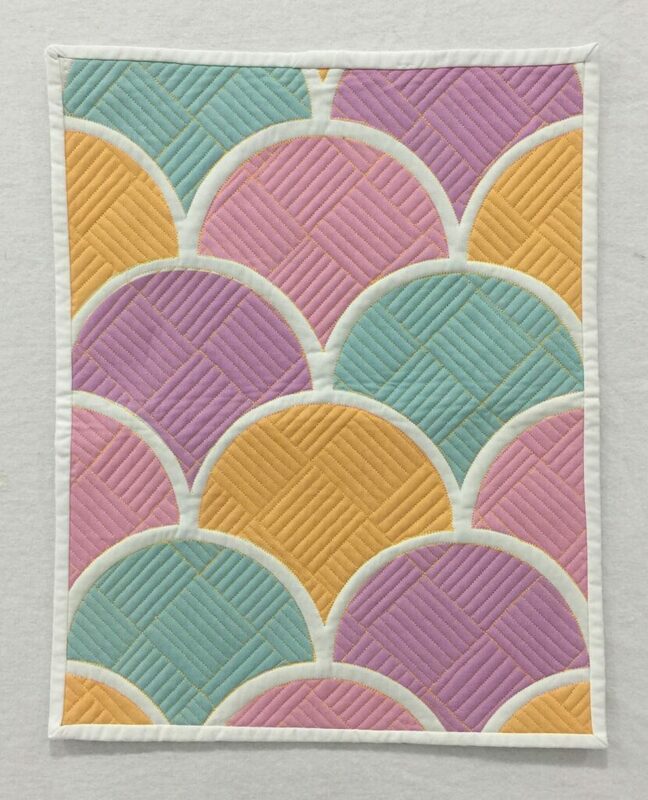 If you want the quilting to really pop, then using just one of those colors–like cream would be a great idea. The cream will blend into the cream colored fabrics, but contrast highly against the darker values of the red and blue. 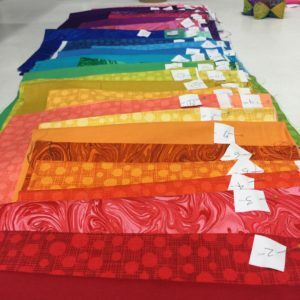 Ask yourself — Do I want my quilting to blend or POP? 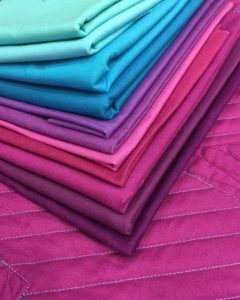 If your goal is great subtle quilting, then select your thread colors to blend or melt into the fabric. 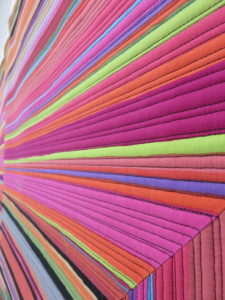 If your goal is high contrast quilting that will POP against your fabric, select thread colors that contrast with the fabric. Also, if you’re a beginning quilter, matching your thread colors to your fabric colors will help conceal any minor mistakes you might make. This is a great confidence building technique to get you started on your quilting journey! What color is your backing? 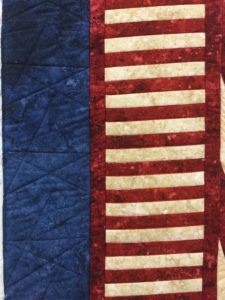 Some people prefer the quilting to blend into the backing, but in this case, the red and blue threads really pop on the cream colored muslin that was used for the backing. 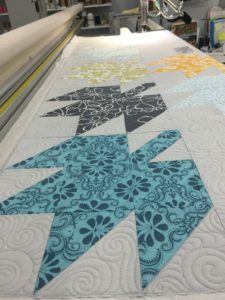 It’s a good idea to think about your backing and what the quilting will look like on the back prior to starting quilting. Look at your borders (if there are borders). So there were two “borders” on this quilt top. The outer border was a dark navy blue, and the inner border was the red and white striped fabric. I quilted stars that connected to each other in navy blue thread on the outer border and the faux SID on the striped fabric. It’s a little difficult to see because of the thread matching, but it’s there :). Select quilting motifs that will complement your border designs. Think about the theme of the quilt. In this case, the theme is pretty straightforward. 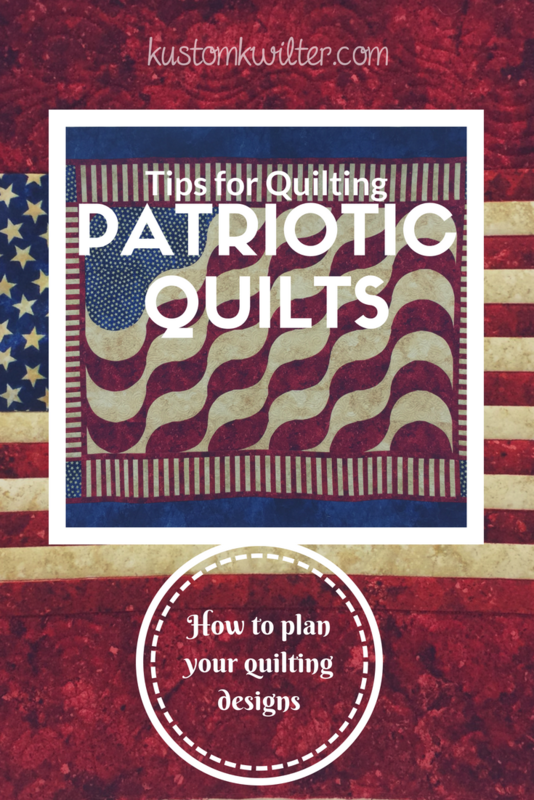 It’s obviously a patriotic themed quilt, so think about designs that go with that theme. Stars, stripes, waves, etc. would all be good choices to go with this quilt top. maybe you have a quilt top that has cats on it, and the cats are made from triangles–you could quilt triangle motifs in the borders, or a ball of yarn, or little mice. Stars probably wouldn’t be a good choice to go with a cat quilt, so you’d want to pick something in theme with the quilt top. Evaluate the purpose of the quilt. This will help you decide the density of quilting that is appropriate and what type of batting you may want to use. 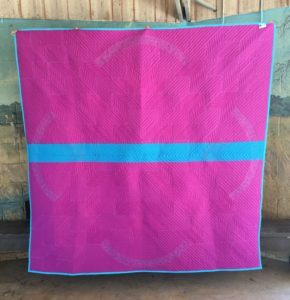 If it’s a quilt that’s going to be a wall hanging, you’d probably want to use a stiffer batting, or maybe double batt with a puffy top like wool. If the quilt is intended to be used often, you might select a poly-cotton blend or 100% cotton-something that would stand up to being washed and laundered frequently.The batting you select might also dictate how far apart the quilting can be. If you buy packaged batting, it will usually tell you how far apart the quilting lines can be (example-up to 8″ apart). Keep in mind the denser the quilting, the stiffer it will feel. A looser quilted quilt will be softer and drape better than a heavily quilted one. Stitch in the ditch might be a lot of work, but the payoff is worth it. I’m a big fan of SID. I haven’t ever quilted a quilt with stitch in the ditch and regretted it, but there have been instances where I didn’t do it and wished I had. It gives the overall quilt a more finished look (in my opinion), and a very polished look. Free-Motion Framework book – Giveaway! I am delighted to announce that I had the honor of contributing to Jen Eskridge’s new book from CT Publishing called Free-Motion Framework. 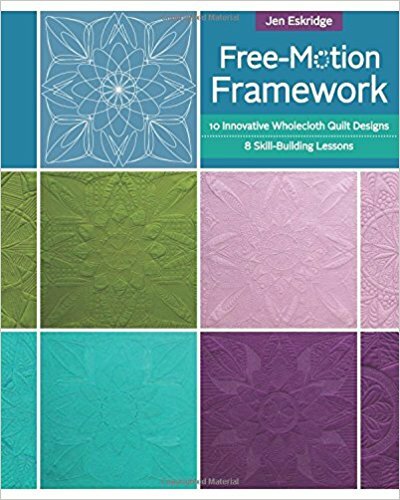 It’s an amazing book that offers tips and tricks for really building your free motion quilting skills. There are so many amazing contributors (17, in fact!) in Jen’s book, you’ve really gotta check it out! Keep on reading to the bottom for two separate chances to win! You must do all three to be entered to win! My giveaway will close Sunday, July 10 and I’ll announce the winner Monday July 11, 2018. The giveaway hosted by me is closed. Congratulations to Marnie Anderson on winning a copy of the book! Free-Motion Framework launched at Spring Quilt Market this past May, and is available on Amazon now. Check it out here! The book includes ten designs that can be transferred to a whole cloth or a single piece of fabric as your quilting guide. I quilted two of the samples included in the book, and really loved how simple the process was for transferring the design to the fabric and then starting to plan your quilting ideas. Jen gives lovely suggestions for how to create your own designs and fill the area creatively. This book is a wonderful exercise in working out your quilting muscles and trying something new. 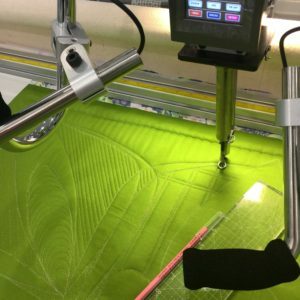 The skills to be gained from this are limitless, but I found that it really helped me plan block based quilting designs much more efficiently and gave me some new ideas I hadn’t tried before. I really like the idea of using hand guided free motion quilting in conjunction with some simple ruler work and straight lines. The picture above is the corner of another of my samples in the book. The designs provided in the book are so simple to use and provide a great study on symmetry in your whole cloth work. I can’t wait to get my hands on a copy so I can quilt up some more of these quilts. Don’t forget to follow the link in the second paragraph to comment for a chance to win some great prizes in this blog tour of Free-Motion Framework! Holy cow!!! 48 different fabrics! I numbered them and then numbered the design I had mocked up in EQ8, but it was starting to get a little crazy. 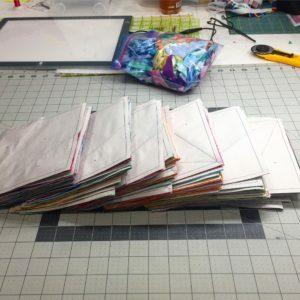 I ended up having to make a smaller swatch card because some of the fabrics were so similar in color and shade that I was starting to go cross-eyed flipping through that stack. I very rarely make swatch cards, but I found it to be very necessary with this quilt. 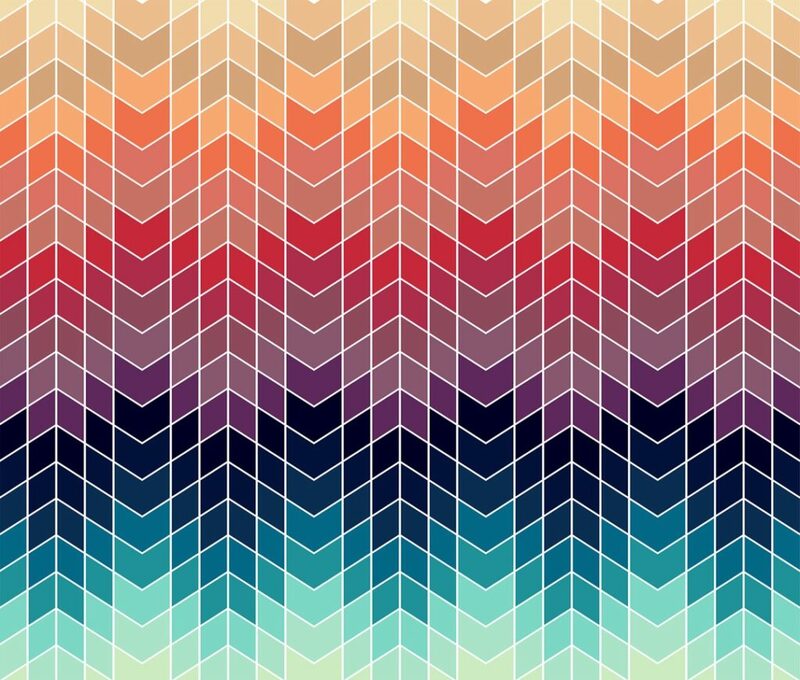 I designed a foundation paper piecing block in EQ8 and then rotated it slightly to complete the design. The piecing went really quickly and I just needed to double check that I had the correct fabric for each block before I started sewing. I’ll admit, there was a good amount of seam ripping to be had with this one! Foundation Paper Pieced Blocks stacked and ready to go! I used my new Daylight Company light box to help with the foundation paper piecing, and I really love how thin and lightweight the unit is. I had a very bulky, cumbersome light box in the past and recently upgraded to this one. It’s been such a nice treat to have one that doesn’t take up all of my cutting mat. I also used Adobe Illustrator to help design the applique text in the right size and fonts, then tiled the pages to make a huge pattern. I hand cut each letter and symbol out, then used the paper as a template to trace onto the white fabric for the applique. I used Misty Fuse on the backside of the white Cotton Couture and then cut out each letter. It was pretty time and labor intensive, but I love how it turned out. I did come up with a slight problem in getting the applique on straight, centered, and spaced equally. Usually, I would just use a big window and tape the quilt in place or trace where the letters needed to be, but I decided to buy a cheap portable projector and project the original applique design onto the quilt while it hung, and then I positioned the letters in place with a small amount of glue from an Elmer’s glue stick. Once they were in position, I lightly fused them into place and then took the quilt top to my Janome MC9400 to complete the applique blanket stitching around each individual letter (that took about a day and a half!). Once I finished the applique, it was time to throw it on the longarm for quilting. I chose just a single layer of Quilter’s Dream Wool to maximize the quilting texture and also keep it fairly lightweight. Then I quilted some straight diagonal lines with rulers to finish it off. I opted to not bind the quilt traditionally, but I faced it to not take away from the overall punch of the quilt, and keep the focus on the applique. I really loved making this quilt and loved the new fabrics being released by Michael Miller Fabrics for Spring Quilt Market 2018. I can’t wait to get my hands on more of that fabric! 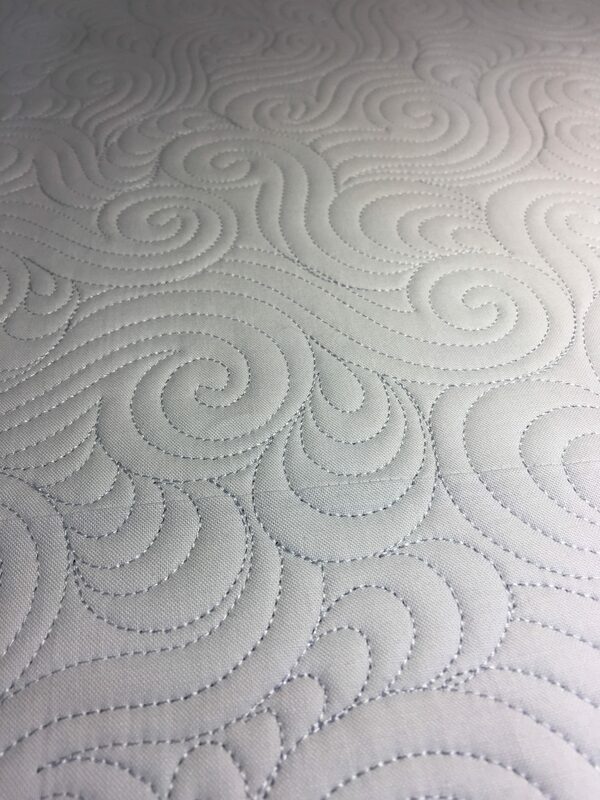 I just love some good free motion quilting! Last month, I quilted some amazing client quilts. 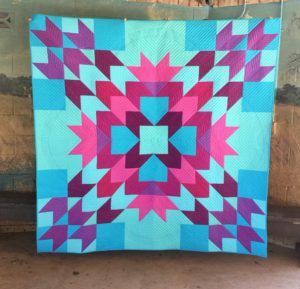 One quilt was a BOM from a local quilt shop – Sew Special in San Antonio, TX, and another was pieced by Kasandra Lee from the SAMQG. The first quilt I mentioned was a quilt pieced by Katelen Postert that started as a traditional BOM using Moda’s Grunge line. Katelen added her own special touch and added some amazing animal appliques to really make this quilt special. 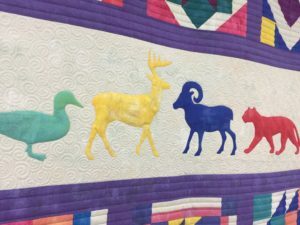 Katelen is so talented, and that mini-parade of wildlife strolling down the center of the quilt is just perfection! 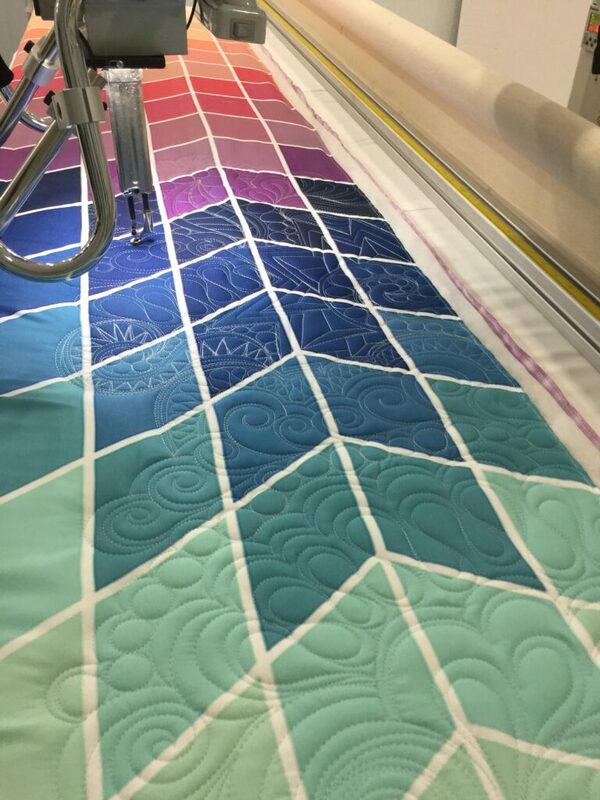 When I met with Katelen for her quilting consultation, we decided on some clean straight line quilting (not too dense), and outline the appliques with some stitch in the ditch and surround them with medium-sized swirls. I used Glide thread in a 50 wt. 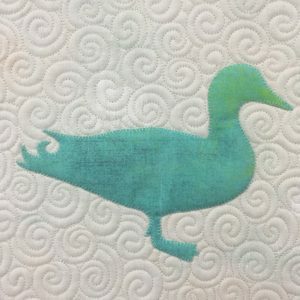 light teal color that matched the duck (along with a lighter cream color for the swirls), and used a single layer of Quilter’s Dream Wool batting. I was so in love with Katelen’s color choices and her addition of the applique was such an awesome touch. Here’s a portion of the finished quilt with the applique. Bravo Katelen!!! Kasandra’s quilt was just as exciting for me to quilt. 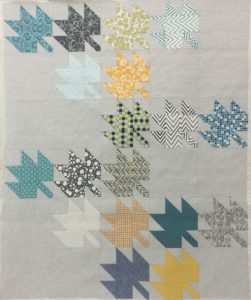 She did a great modern maple quilt with lots of negative space in a cool color palette. I did some diagonal straight line quilting within the maple leaves to follow the lines of the piecing, and then added some free flowing swirls to the background. The batting used was Quilter’s Dream Orient for a functional, soft, and drapey quilt that will be useful in a hot climate. And these are the free-flowing swirls I did in the negative space. This is truly one of my favorite fills to do, and so relaxing to get lost in! I’m so happy I can share these quilts made by some very talented women. I love mixing a little free motion quilting with ruler work and I think it makes the quilt really stand out without being overly done. Hope you’re getting to do some lovely sewing this week! 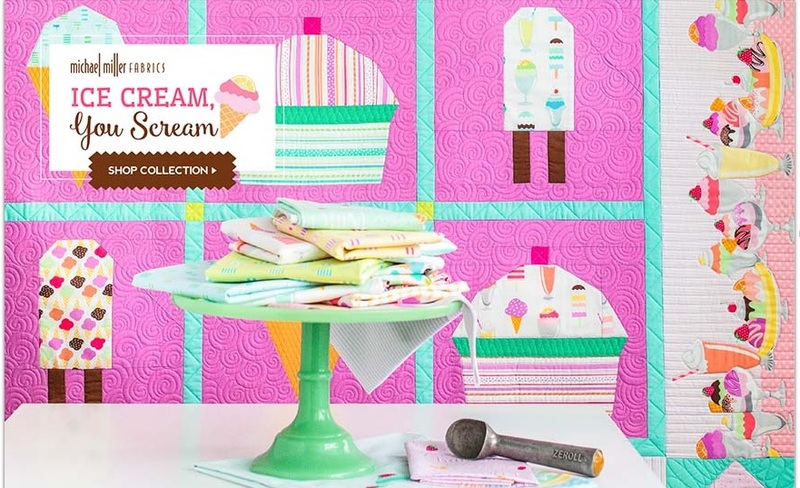 Who wants a free Ice Cream, You Scream Quilt Pattern? Well today is your lucky day!!! 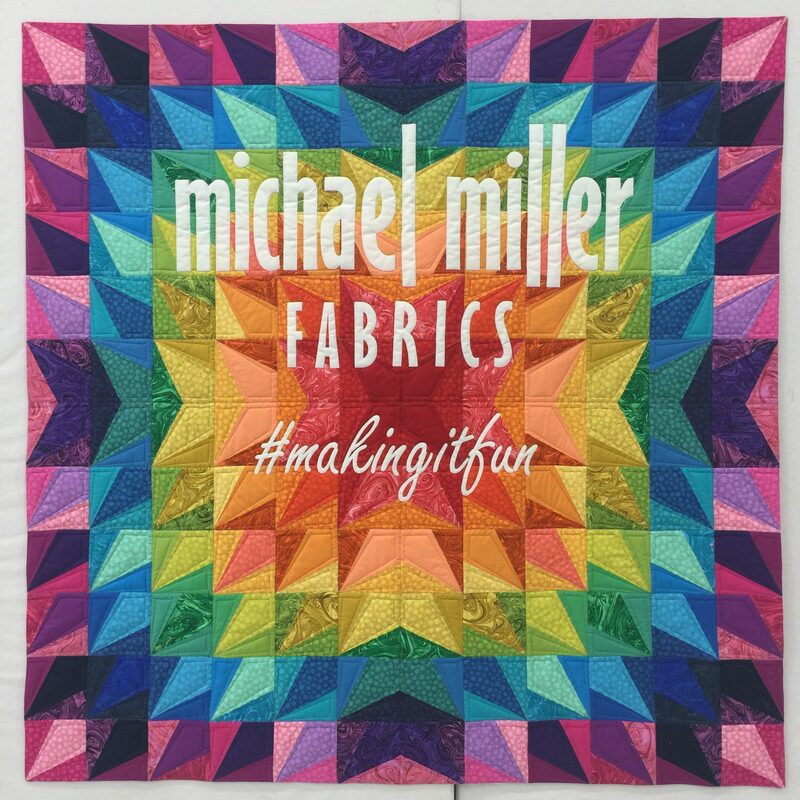 You have to check out this adorable fabric line Michael Miller Fabrics just released. The line is called Ice Cream, You Scream and the colors are everything! Also, there’s this border print that is just dying to be put in a quilt (or made into a little girl’s skirt!! ), and nearly makes me swoon! I got a chance to get my hands on this fabric to design a quilt for the release, and I’m not gonna lie…I spent a few hours just playing with the fabric and coordinating Cotton Couture. It features sweet ice cream cones, sundaes, and the best stripes. It reminded me of the 4th of July and ice cream socials and everything pure in the world. 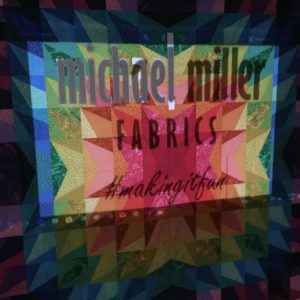 The best part is, Michael Miller Fabrics is offering this pattern as a freebie–you can get your own PDF pattern download from their website. The pattern is for “confident beginners”, which just means you need a general knowledge of foundation paper piecing and fussy cutting. 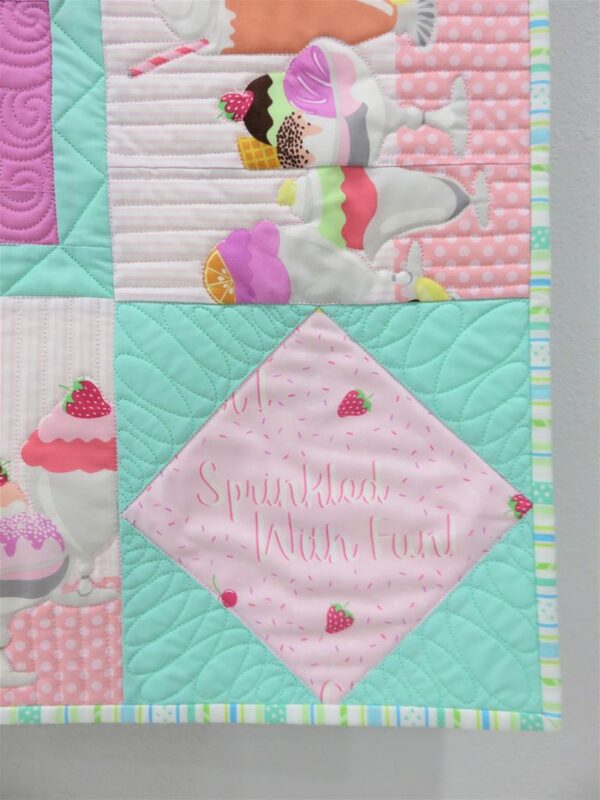 I fussy cut the border pieces so the ice cream sundaes were centered along the center of the borders, and the cornerstones in the border were fussy cut to showcase the cute little ice cream phrases on the fabric. I had a blast designing and piecing the quilt. I had even more fun quilting it! I used Glide thread (from Hab+Dash) and Quilter’s Dream batting in the quilt. I used a few different colors of thread and matched them to the different fabrics. Most of the quilting was handguided free motion quilting, with the assistance of straight rulers for the grids. I’d love to see what you do with the pattern–the foundation paper piecing blocks are pretty quick to sew up. Just remember to shorten your stitch length (I like to use 1.5) so the paper is perforated enough to tear away easily and print your paper piecing templates at 100%. Then add your sashing and borders and voila! Don’t forget to grab your free copy, and check out the pattern (pictured below). Happy sewing!!! Man, oh man! 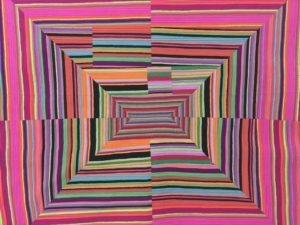 I had the honor of quilting this awesome Kaffe Fassett quilt by Leslie Tucker Jenison. 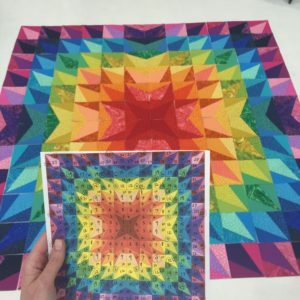 Leslie pieced her quilt based on Kaffe Fassett’s quilt pattern from the book Quilts in Sweden (pictured below-photo from amazon.com), using his fabric. Leslie also pieced the backing using some awesome linen and polka dots. Leslie had requested some straight line quilting to follow the lines of the fabric pattern–I loved that idea. Quilting a quilt like this using a concentric design can be a challenge on the longarm, and you sometimes end up advancing and rolling back the quilt on the frame back and forth, back and forth, back and forth, (did I say back and forth already?) etc. 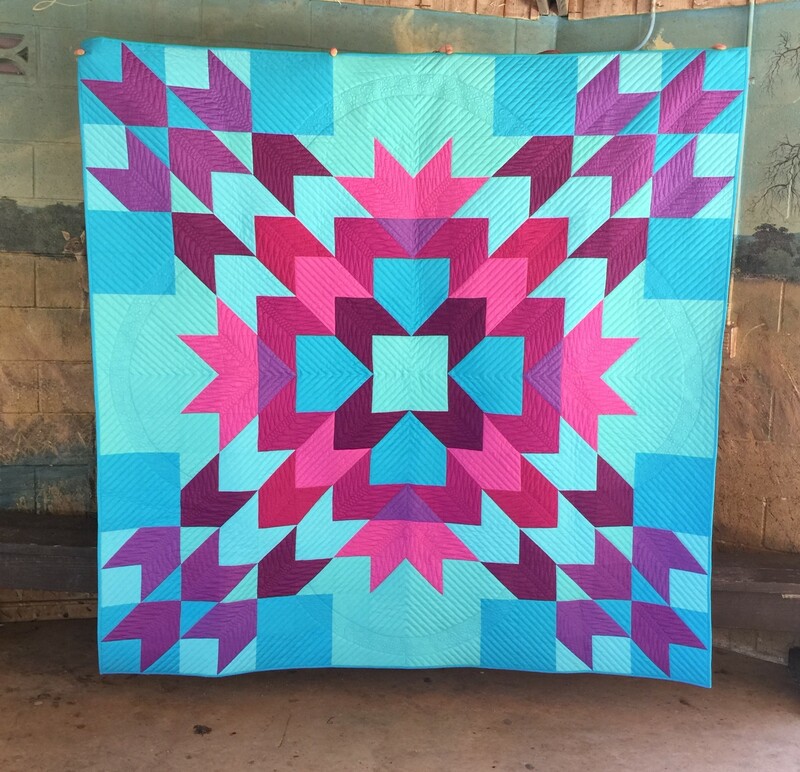 To avoid doing that ONE MILLION times, I connected some of the lines, and I really liked the outcome of the quilting look. The lines of this fabric are so amazingly deceptive and provide the illusion that this was painstakingly pieced. I love the wonky look of the finished quilt and really found the design brilliant! 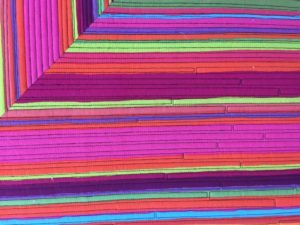 I have been wanting to do a stripe study (kind of like how some people do color or quilt block studies) for so long, and this made me move that up my priority list. Someday soon I’ll start that project. The thread used was Magnifico in black and batting was Quilter’s Dream Orient with Quilter’s Dream Wool layered beneath the quilt top. 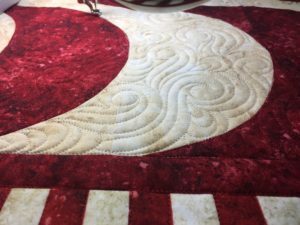 This was quilted using electric channel locks on my Innova longarm (hand guided), and those electric channel locks make all the difference. I recently upgraded and had those installed from the basic manual channel locks that come on the machine. I digress. 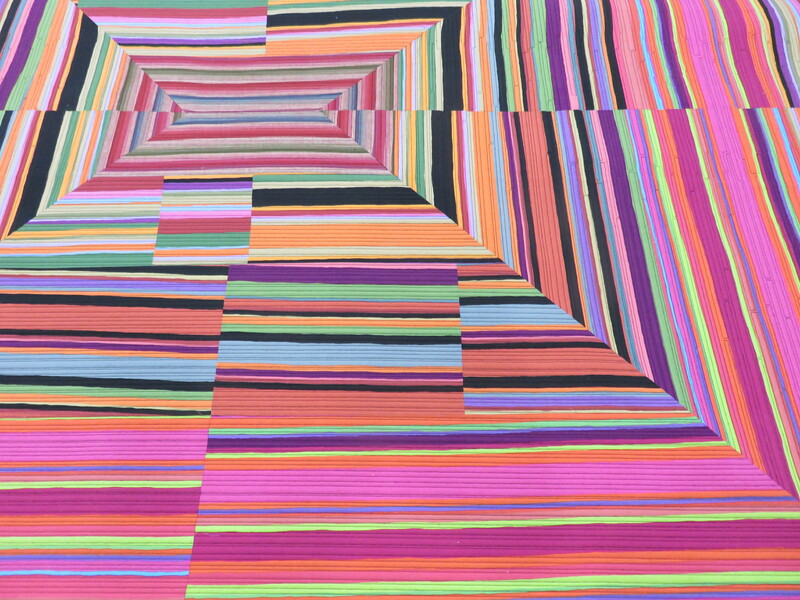 Here’s some more amazing eye candy from Leslie’s quilt. If you’re interested in purchasing the book, you can check it out here on Amazon. Hi! I’m Joanna Marsh from Kustom Kwilts. I live in the Texas Hill Country with my husband and baby girl. 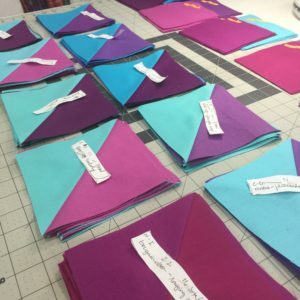 I have been so captivated by all of the #whatshadeareyou projects and the RJR Cotton Supreme Solids, and I’m so excited to share mine with you on the RJR blog today–The Dreamer’s Star Quilt! You can check out my instagram @kustomkwilts to see what I’m up to. I’m so excited to be featured on the RJR blog today with their amazing cotton supreme solids! Check out the What Shade Are You? posts for some amazing inspiration here. A little background on what brought me to quilting: In my previous career, I was a high school agriculture science teacher. My principal’s secretary was a quilter, and I mentioned to her that I was interested in starting to sew. I remember her telling me the secret to quilting was a consistent quarter inch seam allowance–and that as long as I remembered that, I’d be okay! I found a beginner’s quilting book in my teacher mailbox one morning with a sweet note of encouragement from Donna Jo (principal’s secretary), and that was how my sewing journey began. Both of my grandmothers were amazing seamstresses, but I had never learned to sew from them. One thing I’ve learned about the sewing community is that it’s full of people who want to share their love of the craft with others, and I love being part of such a giving community! In 2016, I left my teaching job and committed to sewing and quilting full time. At my 9-5 job (really more like 5-9), I would find myself thinking about sewing in spare moments. The Dreamer’s Star Quilt is a quilt I drew while dreaming of doing the thing I love as a career, and I knew I wanted to use my favorite pattern for the What shade are you project. The design reminds me of the toy kaleidoscopes that produce different images just by turning the end, and how the images can be so bold and impactful. I love quilts that have a large central design and aren’t necessarily block based. 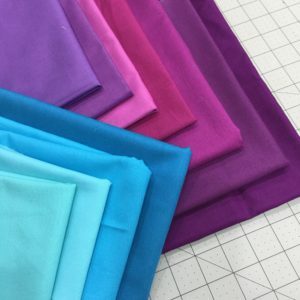 I also remembered that when I started quilting, I struggled with selecting lots of fabrics to coordinate within a quilt, and I wanted a design that would look great with a two-color scheme, but could also make a big impact with lots of colors. This is the original quilt that I used Michael Miller’s painter’s canvas with. 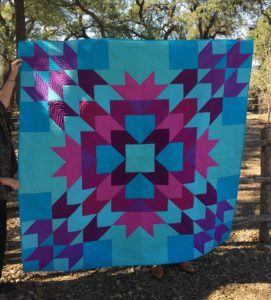 I knew that the Dreamer’s Star Quilt would just glow with RJR Cotton Supreme Solids, and wanted to use colors that would reflect the gorgeous sunsets that we sometimes see out in the Texas Hill Country. Look at those yummy colors! Piecing the quilt together was a breeze with lots of simple half-square triangles and chain piecing. I love these color combos! I love to use several shades of similar colors to create a little depth and dimensions to a quilt. For the backing I used Bougainvillea with a strip of Bora Bora down the middle, and Turks and Caicos for the binding. I loved seeing all the colors melt together, but still be distinctly different, just as in a sunset. Bougainvillea with a strip of Bora Bora really make the quilt back glow. Once the top was completed, I loaded it on my longarm and quilted some simple straight lines with rulers and added some free motion accents in coordinating Glide threads. 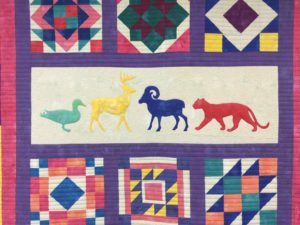 I love using Quilter’s Dream Wool to keep the quilt lightweight–remember, I live in Texas–but still let the quilting pop. I had a lot of fun getting some pictures at the Cibolo Wilderness Trail in Boerne, Texas. It was an absolutely gorgeous day and my husband and mom were my professional quilt holders. Check out other versions of the Dreamer’s Star on Instagram with #dreamersstarquilt and you can pick up your copy of the pattern here. 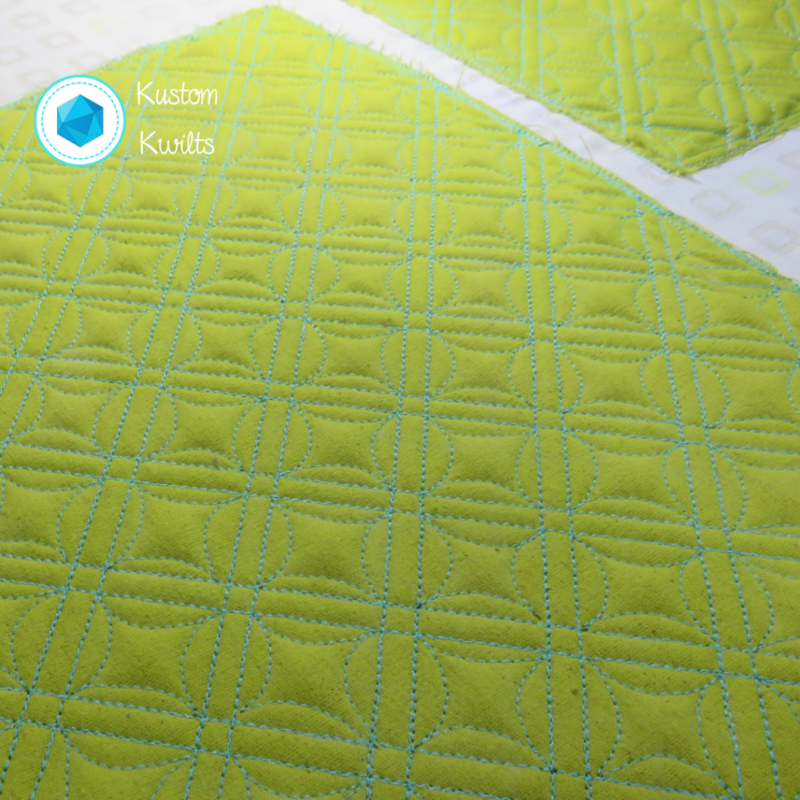 The pattern comes with three different size options, and the color combinations you could choose are limitless! I had so much fun making this quilt and drooling over the Cotton Supreme Solids. 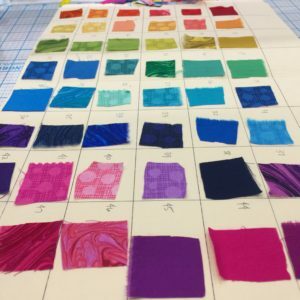 Thanks for joining me in this quilting adventure, and a huge thank you to RJR for allowing me to participate and for the inspiration they bring with the #whatshadeareyou blog hop!